ASPHostPortal is the leading provider of Windows hosting and affordable Orchard 1.10.2 Hosting. Our price starts from $4.49 per month. Orchard is a free, open source, community focused Content Management System built on the ASP.NET MVC platform. Orchard is built on a modern architecture that puts extensibility up-front, as its number one concern. The newest version of Orchard is Orchard 1.10.2. This is a production-ready release for powering your live sites, and is the result of years of development effort and contribution from the Orchard Team and Orchard active community. 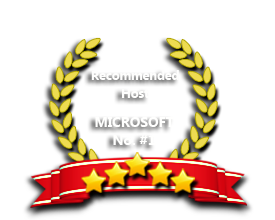 If you are looking for the right Windows ASP.NET Hosting provider that support Orchard 1.10.2, we are the right choice for you. Our hosting include 24x7 monitoring. 24/7 Technical support from our Orchard 1.10.2 Expert. User friendly Control Panel. Orchard 1.10.2 Installation can be done with "One Click" installation, and your Orchard site will be accessible within few minutes! Our Windows Cloud Hosting fully supports Orchard 1.10.2 hosting. You are more than welcome to try our Free Windows Cloud Hosting before you decide to buy. You can get your Free Cloud Windows hosting account up and running within the next few minutes.